This species is widespread in the eastern U.S., occurring throughout much of the Mississippi River system, and portions of the Great Lakes drainage and can often be abundant at given sites. Distribution includes the entire Mississippi River drainage from the St. Lawrence River and its tributaries south to northern Louisiana and west to the tributaries of the Red River, Oklahoma. In Canada, it is common in the Great Lakes and their tributaries from Lake Michigan to Lake Erie, uncommon in Lake Ontario and the St. Lawrence River. Comments: The spike is an elongated, heavy, smooth-shelled mussel. The older shells are dark brown and the bottom margin is slightly arched. It could be mistaken for the kidneyshell or spectaclecase mussels. 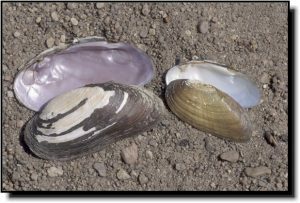 The nacre may be dark purple, lilac, pink, salmon, bluish-white, white or a combination of these colors. It is normally found partially buried within swift currents of gravel or cobble substrate. The spike is known for the occasional black pearl it produces. Another name sometimes used for the spike is ladyfinger. 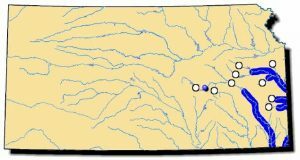 It is found in the Spring, Neosho and Marais des Cygnes rivers but was once more widespread.